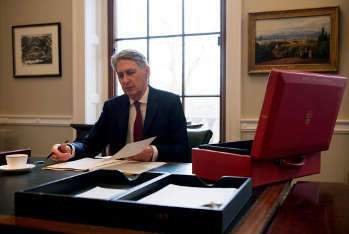 The chancellor will make his Spring Statement at lunchtime on Tuesday and is predicted to offer a more optimistic view of the state of the economy and the public finances than in the Autumn Budget. The BBC reported that Philip Hammond will resist calls to use the cash from improved tax receipts ‘to ease the spending squeeze' on the public sector. The Treasury has said that there will be no policy announcements or tax and spending changes. Mr Hammond will unveil the latest economic forecasts from independent watchdog the Office for Budget Responsibility (OBR) in a 15-minute statement to MPs at 12:30pm. According to the Guardian, Mr Hammond is expected to say the Government will not need to borrow to cover its day-to-day spending this year but only for capital spending, such as investment in roads and railways. The deficit is now predicted to be around £40bn in the current financial year, rather than the £50bn predicted by the OBR in the Autumn. A deficit of £40bn would mean that this borrowing would solely be for investment - the first time this has happened since the financial crisis a decade ago.